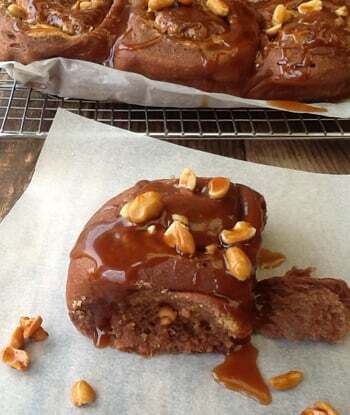 These seriously decadent Chocolate Peanut Butter Buns with caramelised peanuts and a drizzle of caramel sauce are for all you fellow peanut butter fans. It’s winter, it’s time to cosy up in front of the fire with your favourite book or film and help yourself to a Chocolate Peanut Butter Bun, my idea of heaven. Except in reality, I’m in a caravan, in a field but I do have my Kitchen Shed to bake in and I can curl up with my dog and a radiator in the caravan, dreaming about my kitchen to be. 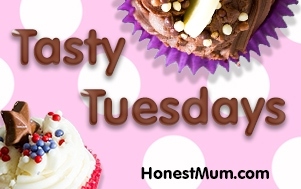 The buns are made from a yeasted chocolate dough with espresso powder to add to the chocolate hit – chocolate tends to slow down the rise so I used just enough to give a chocolate flavour without inhibiting the dough. 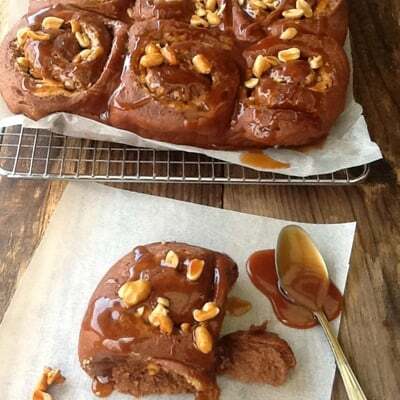 Simply rolled like a cinnamon bun, filled with a peanut buttercream and extra peanuts and then a drizzle of salted caramel sauce while they’re still warm. The result ? 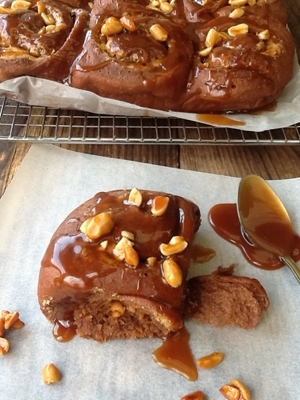 Pillowy soft buns with a crunchy peanut filling and oozing with caramel sauce. I guarantee you won’t be able to wait to eat one … or maybe two. 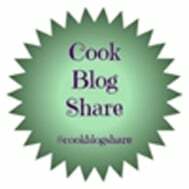 I used Food Thoughts Cocoa as Food Thoughts UK kindly sent me a sample to try. 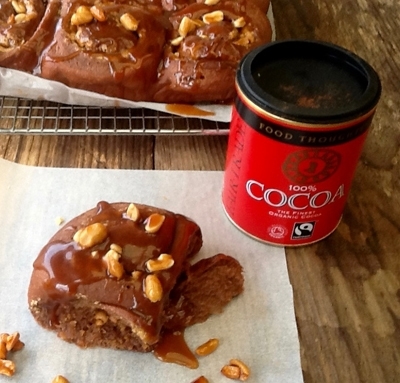 It’s 100% Organic and gluten free Fairtrade cocoa powder with no added sugar, making it perfect for baking and it works so well in my Chocolate Peanut Butter Buns. I’m really looking forward to trying the cocoa in a sponge, so watch this space. Warm the buttermilk (or milk and yoghurt mixture) for 1 minute in a microwave on full power. The liquid temperature needs to be tepid to warm so as to encourage the yeast to start working – too much heat will kill the yeast. Gently warm liquid in a saucepan if you don’t have a microwave. Combine all the dough ingredients in a large bowl, stirring them together until they form a ball. Knead by hand for 10 to 12 minutes. Add the dough ingredients into your mixer bowl. Mix on slow speed number 1 for approximately 1 to 2 minutes then on speed number 2 for 8 to 10 minutes. Your dough should be lovely and smooth and elastic. Place your dough in a large greased mixing bowl and cover. Make the peanut butter cream by creaming the butter and sugar together in a small bowl. Add the peanut butter and golden syrup or honey and mix in well. Roll your dough out to 40 by 25 cm (16 inches by 10 inches). Spread the peanut butter flavoured sugar cream over the dough. Starting from a longside, lightly roll up the dough rectangles like a swiss roll or jelly roll. With a sharp knife cut each into 12 even slices. Lay slices flat in the greased baking tin – leave an even space between the slices as they will expand horizontally as they rise. Leave to rise from approximately 30 to 45 minutes until well risen. Bake in the oven 25 minutes until well risen and firm to the touch. While your chocolate peanut butter buns are cooking make the salted caramel. Dissolve the caster sugar in a pan with the water and white wine vinegar over a medium heat. Once the sugar has dissolved turn up the heat and bring to the boil – do not stir. Let the sauce bubble away for 2 to 3 mins until golden and syrupy. Remove from the heat and add the cream and butter and stir well. Leave to cool for about 5 minutes before stirring in the salt. 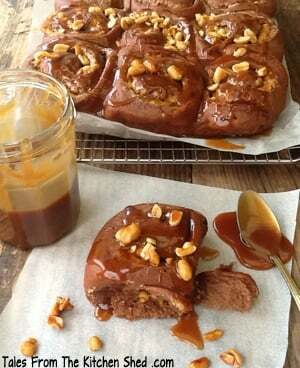 Pour the warm caramel sauce over your warm Chocolate Peanut Butter Buns and enjoy. This sounds (and looks) delicious Sarah. I’ve never made a bread flavoured with chocolate before, and this certainly sounds to be the perfect recipe to try out that process. 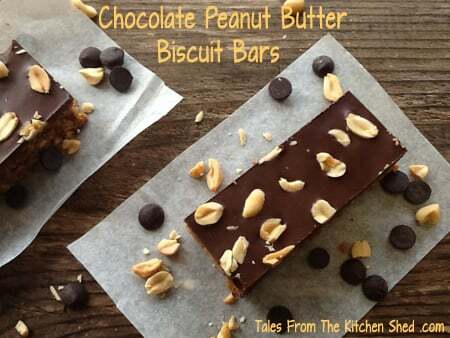 Chocolate and peanut butter are a perfect pairing. These buns are decadent! Thank you for bringing them to FF. How ambitious to make these delicious sounding buns in a kitchen shed. Are you renovating your entire house or only a portion? I love remodeling stories as we are embarking on our own soon. We have also considered renting a caravan for the duration of the project. Thanks for bringing these to FF. The Kitchen Shed is a bit compact but as long as I keep organised it works well as a small space. I won’t know what to do when I get a proper kitchen, lol! We’re rebuilding the whole house, at the moment it is a ruined barn in a field. We’re hoping to keep the character of the place as much as we can though. How exciting to be starting out on a new venture, wishing you all the best for your project Liz. 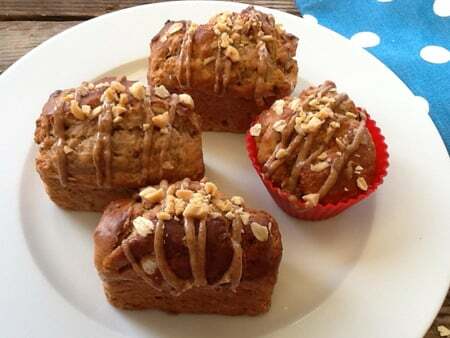 The buns look great and I’m sure they are delicious, chocolate and peanut butter is divine. Thanks Anca, they are rather moreish, I don’t think you can beat a chocolate and peanut butter combo.